Oh my gosh! I have 2 for myself and they give me a super night of sleep. I plan to buy some for my son & daughter-in-law that just purchased a new king bed. 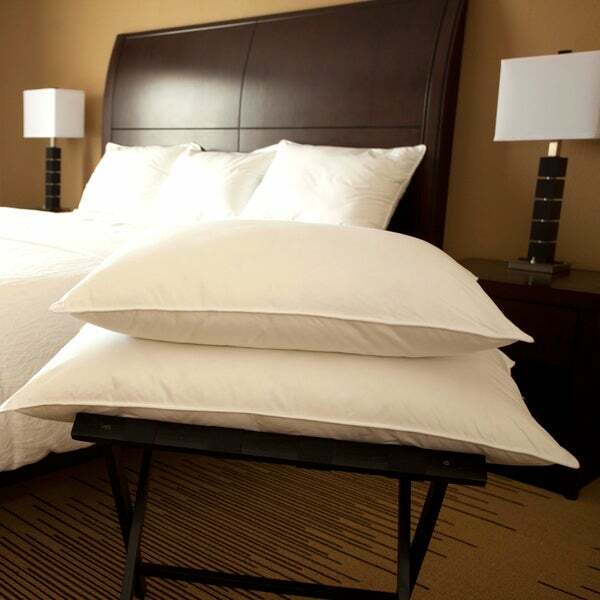 Rest in luxurious comfort with this hotel-style white goose down chamber pillow. Genuine white goose down is blended with white goose feathers to make this pillow exceptionally soft while still providing enough support for optimum neck comfort. Featuring an extra outer layer of pure white goose down, this pillow helps you sleep better than ever and feel well-rested throughout the day. The pillow is just right. It is not too flat and it is very comfortable for my sore neck. IIt was expensive but worth it. . This pillow is wonderful. I have not slept a whole night through in years and the first night I received this pillow I slept amazing. I woke up the next morning feeling rested (also didn't want to get out of bed because I was so comfortable). No feathers popping through either!! This pillow is nice and soft without being flat. It is by far one of the best purchases I have made. Finally!!! A DOWN PILLOW THAT IS ACTUALLY DOWN!! After ordering three types of ostensibly "down" pillows from three companies, these were the ONLY pillows that were soft (yet appropriately firm) and clearly down. One can tell by feeling the exterior of the pillow if it isn't down, and I immediately knew that these were as described on Overstock. These pillows are wonderful, and I would recommend them to anyone in a heartbeat! Furthermore, they are priced well below what they are worth. Thank you!!! They are over filled goose down chamber pillows. Your standard size pillow case will fit very snug or not fit at all. I would not recommend these pillows. I've been trying to find this kind of pillow for a while. When I was little I had a favorite pillow and I never knew the quality until my aunt told me. So I looked online and was led here. I'll be purchasing other goose feathered pillows soon but this was a good start, I'm glad i found this product. A chamber pillow I found out is actually two pillows in one. It's a pillow inside a pillow and with this one, the inside (chamber) pillow is much harder than the outside. I returned the two I had purchased. I love this pillow.A little pricey but WELL worth the money. This pillow is very comfy with a lot of goose down.One thing is I ordered the king size and is actually too fat to fit in the king size pillow case.I took two king size pillow case and have sewn together to make one large case.This pillow is great.I highly recommend it. I shopped on-line on all the sites, and read all the reviews, and decided on two of these pillows. I've been using them daily for a month now, and they remain full, and do not go flat after use. I would highly recommend them. Good pillow for the money. For the price this is a good pillow. It is filled enough to support a side sleeper. I am very happy with this purchase. This pillow is so much more than I thought it would be, light yet sturdy, comfortable to the head and neck. Reminds me of pillows gone past from when I was a child. I will be ordering more of these for all of my bedrooms! Great pillow! Really love them, they have maintained their fluffiness for several years even being real feather pillows. I have used them in a B&B with great success. After only 2 months of use, this pillow has turned into a lifeless rag. It will fluff up but after you put your head down on it the pillow flattens and becomes too shallow. .
Nice down pillow, really soft without losing it's fluff when used. I was hoping it was like the pillow I had at a hotel recently, however it is great and not too firm not too soft. A little to thick but great quality softness. I love this pillow! It took me a week to break it in and really enjoy it. It's nice to have a pillow that lasts. You just have to fluff it up once a night and it feels comfy all night. I've been sleeping a lot better since getting this pillow. "Are these 100% down filled or are they down and feather filled?" Hello lbpeterson, this is filled with 10/90 blend of white goose down and white goose feathers for softness and support. Have a great day! "Do the feathers come through the pillow case at all? I have a down pillow now that has feathers that stick me in the face and neck, even through 2 pillow cases." Hello jeze01, we can appreciate the fact you want a firsthand account of the product. You will receive an email notification every time you get a response. Thank you for shopping with us. No, not at all. This is a wonderful pillow that I can't recommend highly enough, and the first one in my many years on this earth that I've truly been happy with. Hard to find real goose down in pillows these days. Only thing my husband wants to sleep on. I'm hoping the reviews are accurate. "are these pillow made by downlite bedding"
Hello peace4hope, These pillows are so comfortable! Unfortunately, we are unable to disclose the manufacturer of some of our products; however, Overstock.com stands behind every product we sell. When necessary we can contact suppliers if a product issue arises. Thank you for shopping with us.